A focused look at the principles and applications of thermodynamics Offering a concise, highly focused approach, Sonntag and Borgnakke′s Introduction to Engineering Thermodynamics, 2nd Edition is ideally suited for a one–semester course or the first course in a thermal–fluid sciences sequence. 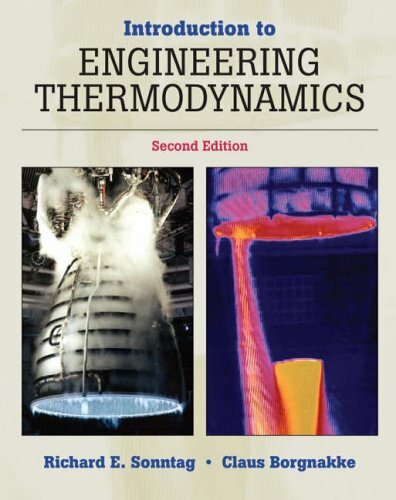 Based on their highly successful text, Fundamentals of Thermodynamics, Introduction to Engineering Thermodynamics, 2nd Edition covers both fundamental principles and practical applications in a more student–friendly format. The authors guide students, from readily measured thermodynamic properties through basic concepts like internal energy, entropy, and the first and second laws, up through brief coverage of psychrometrics, power cycles, and an introduction to combustion and heat transfer. Highlights of the Second Edition ∗ New chapter on Chemical Reactions. ∗ Revised coverage of heat transfer, with a stronger emphasis on applications. ∗ New Concept Checkpoints, which allow students to test themselves on how well they understand concepts just presented. ∗ How–to sections at the end of most chapters, which answer commonly asked questions. ∗ Revised examples, illustrations, and homework problems, as well as a large number of new problems. ∗ ThermoNet online tutorials, with accompanying graphics, animations, and video clips. Available online with the registration code in this text. ∗ Computer–Aided Thermodynamic Tables 2 Software (CATT2) by Claus Borgnakke, provides automated table lookup and interpolation of property data for a wide variety of substances. Available for download on the text′s website.